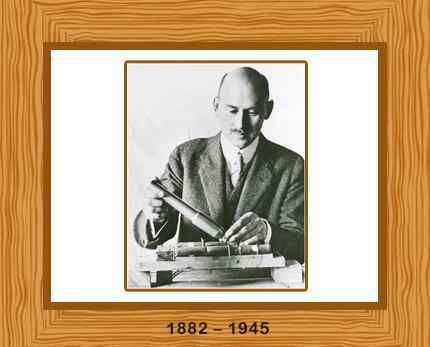 Robert Goddard (In full: Robert Hutchings Goddard) was an eminent American physicist and inventor. Widely regarded as the founder of modern rocketry, Goddard created the first liquid-fueled rocket. He published “A Method of Reaching Extreme Altitudes” in 1919, a classic treatise that remains the most influential work in 20th century rocket science. Born in Worcester, Massachusetts on 5 October in 1882, Robert Goddard was the only surviving child of Fannie Louise Hoyt and farmer, Nahum Danford Goddard. As a child Robert became interested in science and his parents encouraged him, gifting him a microscope, telescope and a subscription to the Scientific American” journal. After reading science fiction novel “The War of The Worlds” aged 16, Robert became fascinated with space flight. Robert was not a healthy child and fell behind at school. Often too ill to attend classes, he became an avid read and he made good use of his local library. His health slowly improved and Robert Goddard attended South High Community School in 1901, graduating in 1904. He then attended Worcester Polytechnic Institute and earned a B.S. degree in physics in 1908. After a year as an instructor in physics Goddard enrolled at Clark University in Worcester and earned a master’s degree in physics in 1910. He received his doctorate there in 1911 and remained at Clark for a year as an honorary fellow in physics, teaching and carrying out rocket experiments. In 1912 Goddard moved to Princeton University with a research fellowship; however he left the following year suffering from tuberculosis. He returned home to Worcester, and while he was recovering, he wrote his first rocket patent applications. In 1914 two of his patents were accepted; one was for a multi-stage rocket using solid fuel and the other was for a rocket that used liquid fuel. With his health improving again, Goddard accepted a part-time position as an instructor at Clark University and here he carried out further research into rocketry. In 1915, he launched his first gunpowder rocket outside the university building; but realized they were very inefficient in converting energy into motion. The following year used de Laval nozzles to improve the efficiency of his rockets. Goddard received funding from the Smithsonian Institution in Washington, D.C., in 1917 to support his research into rockets that could reach the upper atmosphere to release weather recording devices. His research was published in 1919 in the treatise “A Method of Reaching Extreme Altitudes” which detailed mathematical theories of rocket propulsion and his gunpowder fueled rocket experiments. It also included a proposal regarding a rocket flight to the moon; this was considered far-fetched nonsense at the time. Goddard then turned his attention from powdered fueled rockets to liquid fueled rockets. Robert was the first scientist to realize that liquid oxygen was the element essential for combustion in a rocket. He established that rockets based on atmospheric oxygen could never fly in space, where the lack of oxygen would eliminate combustion. Goddard also discovered the rate of combustion depends on the amount of oxygen and designed a rocket using a combination of gasoline and liquid oxygen as fuel. On March 16 in 1926 he launched his first liquid fueled rocket; it reached a height of 41 feet and averaged a speed of about 60 miles per hour. Wernher von Braun, a German physicist and a friend of Goddard, instituted the German Rocket Society in 1927, following Goddard’s March 1926 launch. The German army began research to create a long-range missile using liquid propellants in 1931. Goddard unknowingly assisted the program by answering telephone queries from German engineers. However, by 1939, Nazi aggression alerted him. Goddard received funding from the Guggenheim family and he moved to Roswell, New Mexico in 1930 and continued his research. His work “Liquid Propellant Rocket Development” was published in 1936. From May to July of 1940, Goddard explained to U.S. Army and Navy officials about the German threat and the necessity for the United States to produce its own long-range missiles. Although war planners largely ignored him, thinking that Germany was not capable of launching a missile across the Atlantic, Goddard worked for the navy between 1942 and 1945, as director of research in the Bureau of Aeronautics, creating experimental engines. Goddard became a consultant for Curtiss-Wright Corporation, a leading aircraft firm, in 1943, and director of the American Rocket Society in 1944. In 1924 he married photographer Esther C. Kisk; they had no children. Robert Goddard died of throat cancer in Baltimore, Maryland, on August 10, 1945. Goddard was 62 years old. He is credited with 214 patents, of which 131 were filed by his wife after his death.